Summary: This project will replace 3 Florida Power and Light (FP&L) standard cobra fixtures with cut off cobra fixtures and shield 2 cut off cobra lights. All of the lights are located along Hickory Boulevard on Bonita Beach. FP&L will be responsible for the installation labor. These FP&L pole lights are all visible from the beach and sea turtle nesting habitat. They have directly or indirectly disoriented sea turtle hatchlings over the years. Changing these lights will reduce the impact of beach-front lights on nesting beaches, while still providing light in the parking lots and driveways for the residents. Bonita Beach is an important sea turtle nesting beach in Lee County. Lighting compliance has improved over the years particularly at the north end of the beach, which consists primarily of condominiums. This project will bring these lights into compliance so that they are not visible or directly/indirectly illuminate sea turtle nesting habitat. 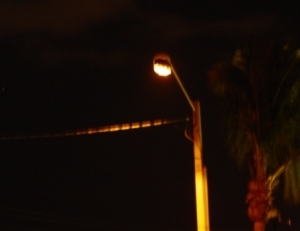 Results: The standard drop down style cobra fixtures were replaced with full cutoff cobra style fixtures on three FP&L pole lights along Hickory Boulevard on Bonita Beach. These lights have been problems for many years and have contributed to several disorientations. By changing and shielding these fixtures, we corrected problem lights that have affected the nesting beach from many years and we will continue to build on our relationship with FP&L. When the project was completed, we met on site at night with a newspaper reporter to do a story. We looked at the lights from the beach and from the street. We discussed different types of lighting and the effect light has on sea turtles. The story was submitted and ran October 7, 2010 in the Fort Myers News Press. Bonita Beach had a number of lighting issues this past nesting season, which resulted in an increased number of disorientations. However, none of them were as a result of the FP&L lights. The success of this project is finally eliminating the problem FP&L lights that have impacted the nesting habitat for many years. This in turn provides a new opportunity to educate the residents on appropriate lighting and work to reduce the impacts of other problematic lights in the area.